Armeria or sea thrift features low, evergreen foliage with pink ball-like flowers on upright stems. It’s a wonderful addition to a rock garden or raised bed as it prefers full sun, well-drained infertile soil. 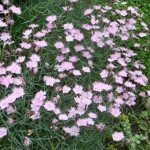 Sea thrift or armeria may rebloom in the summer if deadheaded. Dianthus or pinks offer pretty blue-green mat-forming foliage with fragrant flowers in many shades of pink. It makes a great front-of-the-border plant and prefers full sun in well-drained soil. Euphorbia or cushion spurge blooms sulfur yellow in May, then the foliage turns rich red in the fall. It prefers full sun and is deer and rabbit resistant. Iris – one of the queens of the garden, July is the ideal time to plant iris so that it may establish and bloom next year. With many varieties and colors to choose from, iris prefers average to well-drained soil in full sun to part shade, depending on the type. Peony – an heirloom favorite, plant them now so they will establish and offer even more flowers next year. Once the flowers are gone, enjoy the ferny foliage that may have a nice fall color. Pulmonaria or lungwort – these lovely additions to the shade garden offer pretty pink and blue flowers in spring then attractive silvery speckled foliage through the summer. Happy in average soil in part shade, they make excellent companions to hosta and ferns.